Focus on the sales funnel is a key to growing your company. 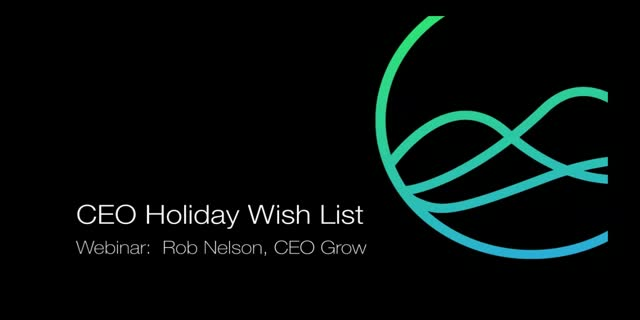 As CEO of Grow, Rob has focused every team in the company on the sales funnel with incredible results to show. Attend to learn how you can replicate this as well as Rob's plans for improvement in 2017. Includes Q&A for live attendees! By now, organizations understand that using data effectively is a key ingredient to winning. But why is it so hard for so many organizations to really use their data to gain a competitive advantage? Find out how drchrono and grow are joining forces to solve this problem. Explore your data like never before with Grow's latest feature release: Filter and Drill! Our skilled product team will walk attendees through the new features and answer live audience questions. Are you jealous of other sales leaders' dashboards? Nothing's more frustrating than lacking insight on your sales data, so breakup with bad reports and make a dashboard deserving of your love! Hannah Butcher (Director, Sales Operations) will guide us through some metrics every sales leader should have to gain insight, catch problems, and maximize growth. Q&A for live attendees is included. Most data needs complex preparation before it's ready for your dashboard. But with Ben's quick and easy steps, you can get better visualizations, better dashboards, and ultimately better insights—with less SQL. How? Join us January 25th to get a walkthrough of new features that make data prep simple, plus a live Q&A with Ben. Learn how Jake Young, VP of Sales at Grow, led sales to skyrocket using the right metrics in real-time, openly displayed on TVs throughout the office. Smart business decisions are easier to make when you’re armed with current, relevant information—and leaders who know more gain the confidence, respect, and loyalty of their employees. Teams that know the score are more engaged and inspired to succeed because they know what they need to do to win. Get a walkthrough of our October 2016 release to learn how we're improving your ability to consume and act on data in real time. Includes live Q&A with Grow's VP of Product. Grow.com is the simplest way to access your data and visualize it in a real-time scoreboard. When business performance is measured it can be improved. And teams that know the score, play to win! Grow is the simplest way to access your data and visualize it in a real-time scoreboard. When business performance is measured it can be improved. And teams that know the score, play to win!